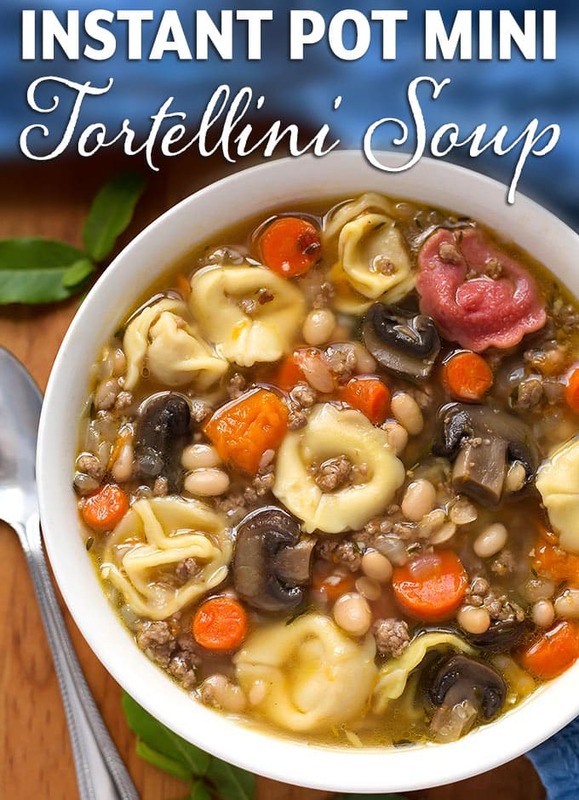 Delicious Instant Pot Tortellini Soup is the next recipe in my “Mini Series” of Recipes for the 3 Quart Electric Pressure Cooker.” Tasty pressure cooker tortellini soup has veggies and lean ground beef or ground turkey, and Lots of flavor! You can easily double the recipe for the 6 qt pot. Making a meal for just one or two people is one of the biggest cooking challenges for me. In my family I’m known for cooking “for the Seventh Army,” which I never quite understood the meaning of! What about the First through sixth? The gist of it is that I make a lot of food. Now that it is just Paul and I most of the time (since our youngest son got his car) I find myself scaling back my normally large vats of food so we don’t end up with leftovers for days. The new 3 quart Mini electric pressure cooker is forcing me to make smaller quantities since it doesn’t hold as much as the standard 6 quart models. I’m actually having a lot of fun scaling my recipes, and coming up with new ones, like this Instant Pot Mini – Tortellini Soup! This recipe makes about 5 cups, and is very flavorful and filling. 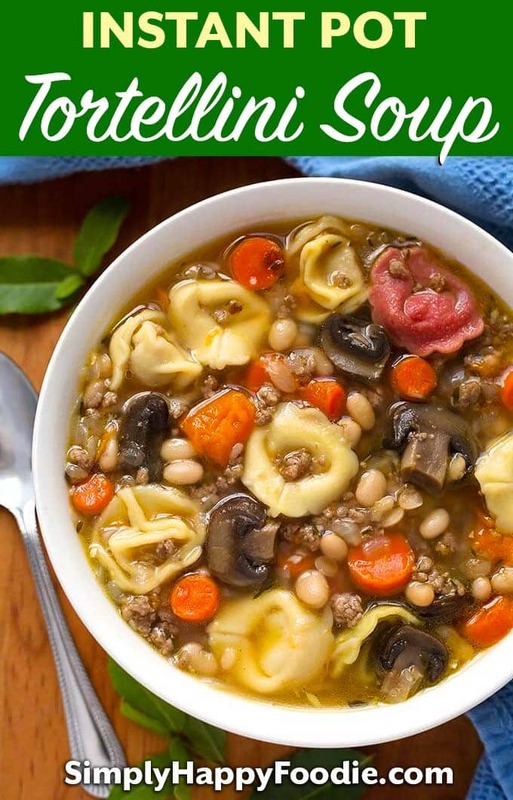 If you have a larger pressure cooker, you can easily double this Instant Pot tortellini soup recipe, keeping the cook time the same. With this soup you can play with the ingredients. You may not always have these exact items laying around, so you can throw in what you like: zucchini, corn, celery, to name a few. If you can, try to keep the herbs the same, as they impart the wonderful flavor that makes this so delicious! 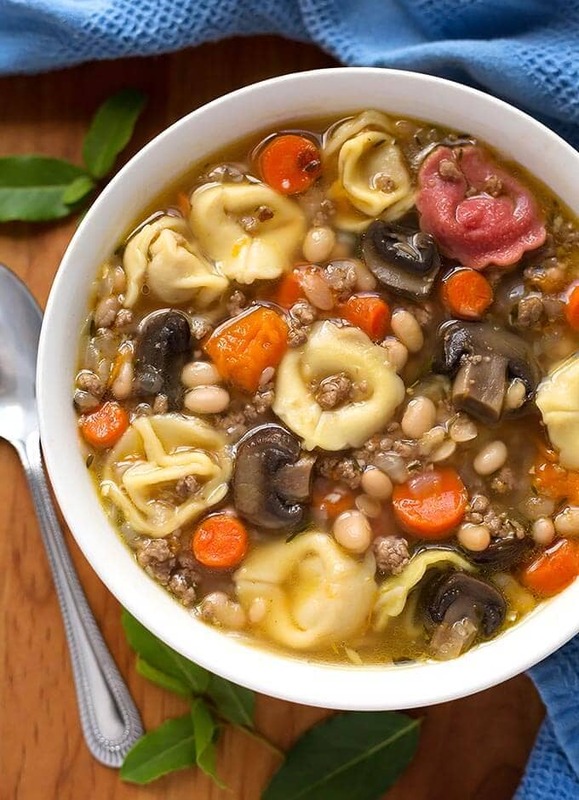 Instant Pot Mini - Tortellini Soup is flavorful, with rosemary, thyme, & mushrooms. Easy to make in the 3 quart electric pressure cooker. Makes 5 cups. Turn the pot on to the Sauté function (Normal/Med heat). When the display reads "Hot" add the meat (add a little oil if using ground turkey). Cook, stirring occasionally, until almost done. Add the onion and carrots and stir. Cook a few minutes, stirring occasionally, until onion starts to turn translucent. Add the garlic and ginger. Stir. Add bay leaf, thyme, rosemary, mushrooms, salt, pepper, and beans (also sweet potato, if using). Press Pressure Cook (Manual) and then the + or - to choose 5 minutes. When the cooking cycle ends, let the pot sit for 5 minutes (natural release). Then turn the steam release knob to the Venting position to release the remaining pressure/steam. When the pin in the lid drops, open the lid and stir the soup. Taste and adjust salt, if needed. 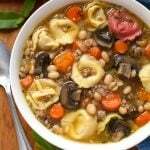 *Omit meat and use vegetable broth for vegetarian version. Thanks so much for these mini pot recipes. They will help me to create some of my own along with enjoying yours. Hugs. We have the MINI in our RV (6 qt left at home), and I struggle with “halving” recipes … (What do I do with half a can of…?). Very happy to find your MINI set, and tonight I made the tortellini soup. YUM!! Thanks for this; will definitely make again ?